Hot juicy berries wrapped in a thick, soft dough, made with just yoghurt and flour. 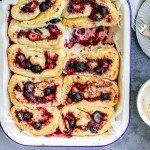 You won’t believe how easy it is to make these delicious berry scrolls. Preheat your oven to 180C/355F and line a shallow baking dish (I used a 28cm/11inch dish) with baking paper. Melt the butter. Set aside. Slice the strawberries (you can use other berries like raspberries and blueberries whole), then transfer the berries, rice malt syrup and cinnamon to a small bowl and stir until combined. Next, add the flour and yoghurt to a large bowl and mix until they come together to form a dough. Turn out onto a well-floured bench top and knead until the dough is smooth and holds its shape. This should only take a minute. Use a floured rolling pin to roll the dough into a rectangle about 1cm/half inch thick using your hands to help shape the dough if you need to. Brush the top of the dough with butter, reserving a little for the top of your scrolls. Finally, spread the berry mixture on top of the dough, leaving a 2cm border around the edge. Starting from the long side, use two hands to roll the dough into a long log. Cut the dough into 12 equal pieces and place them in the baking dish, touching side by side. If they don’t quite touch, squish them down using the palm of your hand. Brush the tops of the scrolls with the remaining butter. Cover the baking dish with foil and transfer to the oven. Bake for 10 minutes. Remove the foil and bake for a further 20-25 minutes until tops are golden and the scrolls are cooked through. Blackberries, blueberries, raspberries or strawberries. Work with what you’ve got. Because, any combo of berries is delicious in these buns. …come to those who sign up for our emails. All the latest. In your inbox. Once a month. Plus, a weeknight meal plan to get you started. Check your email for a link to your free plan! I promise to send you only AWESOME stuff and will never give your name or email address to anyone else!